The Lego Movie 2 is in theather since the end of February, and of course we were flooded with promotionnal product, goodies and a bunch Lego sets. 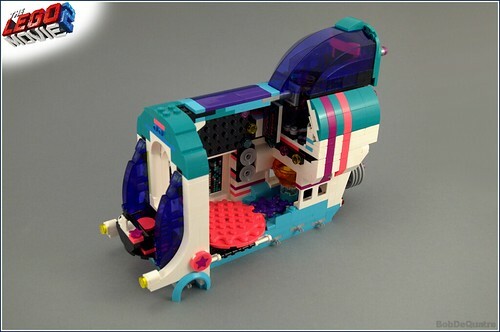 Looking at these sets early, I was very interested in the Pop-Ip Party Bus, because of its colors, the overall roundness and the cool parts I could spot here and there (that's the MOCer in me speaking). Let's see if the set actually meet my expectations! At this time, I still haven't seen the movie, so please forgive that I may be wrong on some points. Thanks to EB and the LEGO CEE Team and Designers for giving me the opportunity to review this set! The set comes in a rather big box, with a Lego Movie 2 livery. The front shows the bus in its two configurations: in drive mode, fully closed and with the winglets deployed, and in fully opened state, with light on. As usual, the back of the box depicts all the play features. Once opened, the box gives us a 171 pages instruction manual, a rather small sticker sheet (we'll discuss about it later in the review), 8 numbered bags of parts, and a loose big trans-purple canopy piece. Many people, including me, reported that the big tranparent part was scratched when they opened the box... I think Lego should pack these kind of parts in a separate bag to avoid the problem! The building process is rather simple, the instructions are clear and easy to follow. I really enjoyed building the set, and it felt like almost half of the parts are either new or in a new color! Here are pictures of the build after each bag (two pictures for bag #7). The completed build looks very sleek and smooth, with the colored lines reaching from the top to the sides. The trans dark purple parts really stands out on the white and teal. The front of the bus can be detached, allowing Zebe to take it's place on the driver seat. The top canopy can be flipped open, but whoever took this place will be flipped over at the same time, which feels a bit werd. Let's now take a look at the Party Bus fully opened! With the Disco bal standing high above and the foldable speakers on the sides! Melody can dance on the upper dancefloor while Tempo plays the music. Disco Kitty can sho her dancing skills on the two rotating dancefloor on the lower level of the bus. 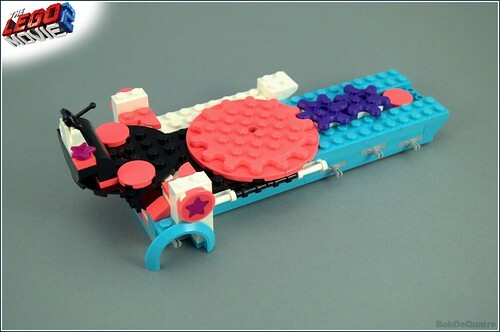 These uses a new kind of 2x2 turntables and of course new gear wheels that are a plate high and have studs on one side. 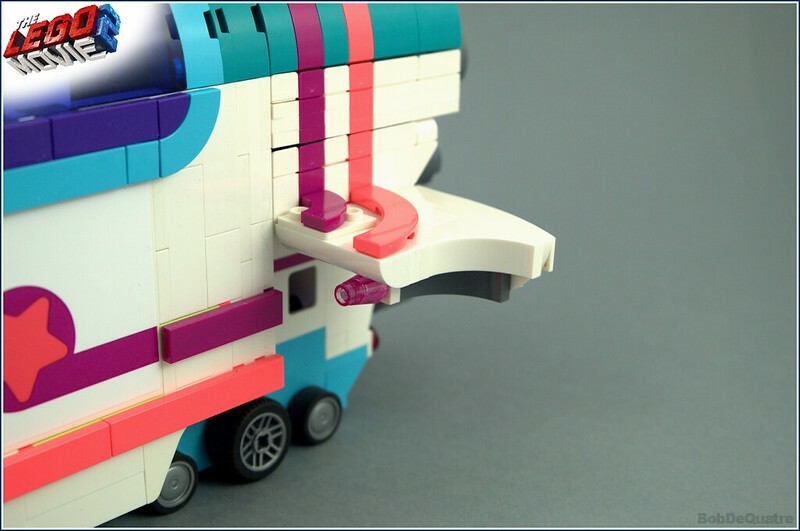 Turning the big thruster on the back of the bus will make the inner dancefloor spin, and pushing on it will trigger the light brick! It's ligh will pass through an Elves half dragon egg piece that also rotate and will splash the light like a disco ball. On the plus side, the bus also have two small wings on the sides that can be lifted or lowered. These are well integrated in the build. On the minus side are the stickers... again... Especially the bg one on the side, showing an important color variation. We know TLG has problems with white bricks, so it's no surprise white stickers don't do well either. Every time I'm building a set and I can't find a part, I say to my girlfriend "Oh there's a part missing!". Now she knows that the part is there somewhere, hidden behind another part, or sometimes just in front of me but I can"t see it... That set was different, as I couldn"t find a part because it was the wrong part in the sealed bag! On the left is the Technic part that should have been in the set, and on the left is the one I got. Do you had the same problem with the set? 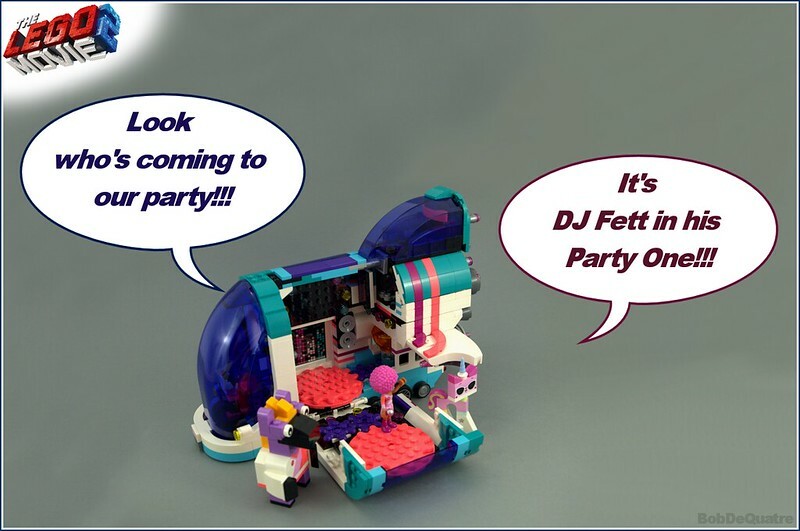 The Party Bus comes with two brickbuilts figures: Disco Kitty and Zebe. The later make use of some nice new pieces, and has a very nice printed "torso". 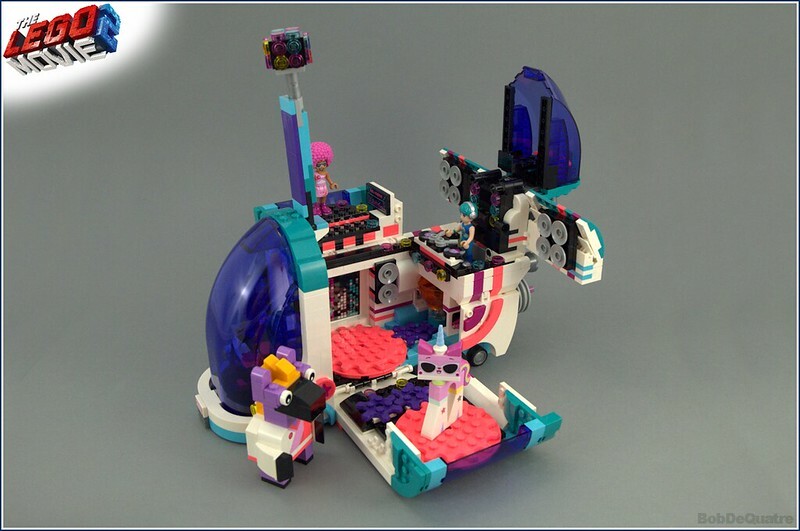 Unikitty looks as fun as always in her disco livery, and her high boots. Two friends minifigures are also part of the set: Melody and Tempo. TThese are very nice, with their exclusive and bright hair parts. I'm already imagining using Tempo as a starfighter pilot! I didn't took a picture of all the interesting parts in the set... because I want to keep it intact for now... But just take a look at the set's inventory on Bricklink. Ok let's just look at numbers! 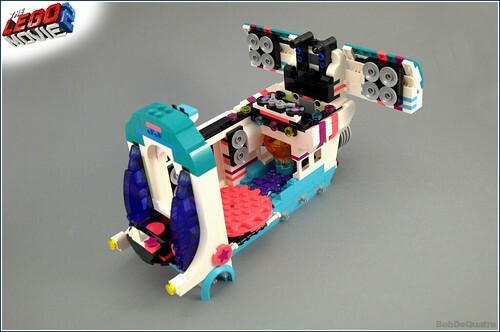 The set has 1024 pieces, divided into 259 different parts, 45 of wich are noted as new on Bricklink, and 33 being exclusives (for now) to this set! I'm very impressed by the new coral color, it looks very vibrant and colorful. Pictures don't do it justice. Design: 8/10 - A nice design, with lots of playing areas and functionalities for a set of this size. Parts: 10/10 - The first time I ever gave a 10 in this category! Lots of nice colors, lots of new parts, lots of new parts in new colors! Four exclusive minifigures, counting the brickbuilt ones. Build: 7/10 - A simple build but yet using some nice techniques. Price: 7/10 - With a ppp of 0,078€, this set is rather average, but the part inventory is realy worth it. Overall: 32/40 (80%) - A really cool set if you like Disco and the 70's... Or if you like good Lego sets, cool parts and cool colors! This is easily my favorite set this year, though I do have one minor complaint, that being that Melody's huge hair makes her have to lean forward quite a bit to fit in the top seat when the bus is closed. Adding a couple of plates of thickness to where the feet attach is a simple mod that can solve this issue. Regarding the color variation on the white stickers, I think that may just be a consequence of using white-backed stickers, which are presumably not printed in white ink, but rather have white as the base color for the sticker paper—Lego's white bricks, on the other hand, are in fact designed to be slightly off-white even without taking into account discoloration (just as their black bricks are a touch brighter than pure black). Clear-backed stickers would avert this issue, but I prefer the white-backed ones as they're easier to apply cleanly. 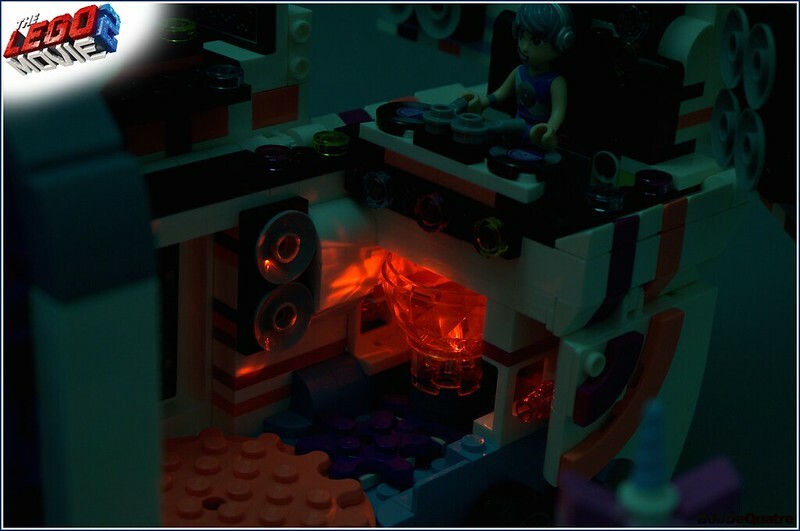 The set generally displays better in somewhat dimmer lighting anyway due to both the sticker color being less apparent and dimmer lighting enhancing the appearance of the light brick function. 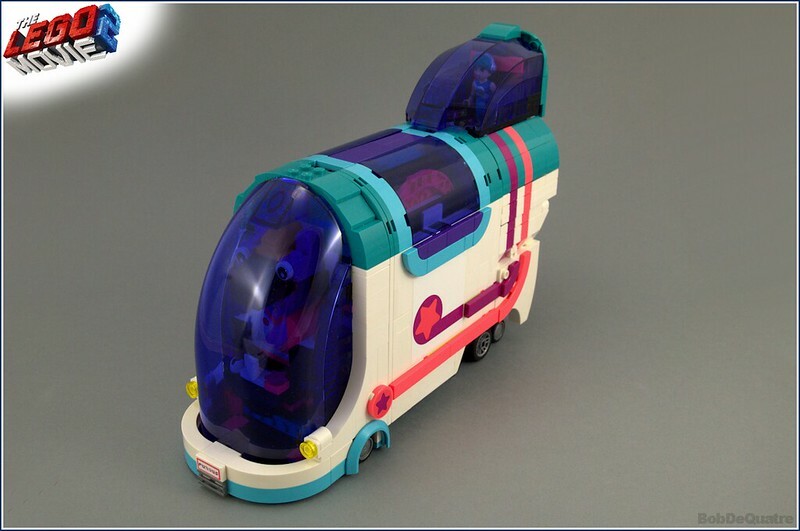 I do have this set via a promotion I won earlier this year, and while I wouldn't buy this for full €95 local retail price, I do think the set is still very unique to what it is : A disco, a bus and a spaceship with unique parts and rare colors. The new coral color is really amazing in real life, can't really compare it on a digital screen. This was the very first set I bought from the TLM2 theme. Having built them all (except the spring wave coming next week), it is still my favorite set in the theme! It's just so unique looking. The play features are intuitive and perfectly executed. Love this set! It's got lots of really advanced techniques I feel like I learned a lot from, like how it was able to use curved slopes for a nearly seamless transition from the 4x4 quarter circle elements used for the canopy, the way the light brick button and gears can both be activated with one hand (using a far more compact mechanism than the one used for the light brick in the Temple of Airjitzu's shadow puppet theater), the use of a towball and double clip as a locking mechanism rather than a hinge, and of course the combination of a light brick with a faceted transparent element to refract the light in all directions! 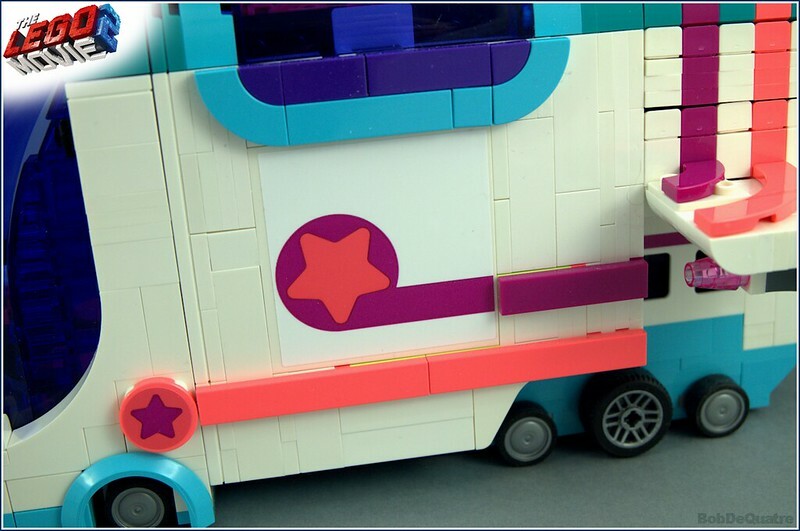 The color scheme is refreshingly original, unlike any we've seen in any themes before, even ones like LEGO Friends and LEGO Elves that have featured several of the same colors individually. The curvy design language is also a delight — I've learned over the years that creating models primarily defined by smooth curves using what's usually thought of as a blocky and rectilinear medium is a challenging but always gratifying experience! It really helps push the futuristic feel of this set in a way we haven't seen before, calling to mind similarly streamlined and opulent visions of the future like the Heart of Gold from the Hitchhiker's Guide to the Galaxy movie or EVE from WALL•E. And it contrasts well with Rex's much more boxy and angular fleet, reinforcing their diametrically opposed roles in the movie itself. 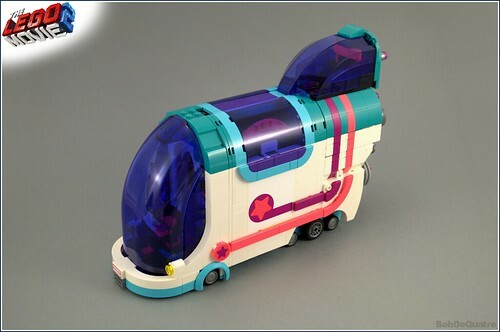 The cartoonish "bus" elements like the tiny wheels are also lots of fun. I wouldn't mind seeing a full space theme with this aesthetic! The mini-doll characters are great, what with their expressive faces and colorful fashion sense. I love the curvy and brightly-colored star patterns on their outfits and the bus itself, which remind me of both Steven Universe and Kirby! Disco Unikitty is as much of a delight as any of the Unikitties from the first movie, especially her comically large high heels and rainbow tail. Zebe is also a lot of fun, even though I didn't recognize him as a zebra until it was pointed out in a designer video. After getting the set, it was a little more obvious due to his equine-looking mane and tail, but when the first pics of the set appeared and showed him from more limited angles, I thought he was some kind of bear. 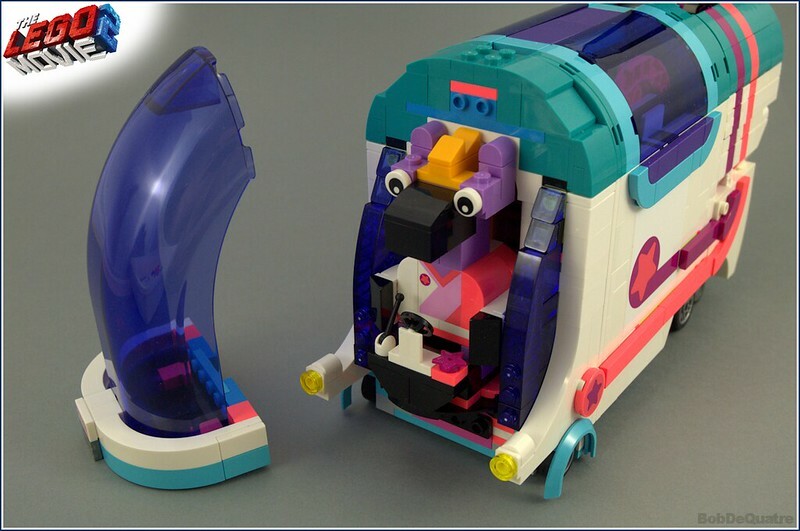 I think it says a lot about some folks' biases that a lot of people who feel underwhelmed by the LEGO Movie 2 sets seem to completely disregard it, and yet feel like Benny's Space Squad was a standout set of its wave just because it pandered to an extremely superficial sense of nostalgia. Or for that matter, how many fans of the classic themes lament how today's sets/themes are "no longer original", yet dismiss most sets that do really new and creative stuff instead of adhering blindly to aesthetic and subject matter standards established 30 years ago. Let's not forget the Facebook users that put their misogynistic biases on full display for all the world to see with ignorant comments like "nobody wants mini-dolls or brick-built characters!" Hopefully this set's sales continue to prove them wrong, just as LEGO Creator and LEGO Friends sales have been doing for years. Fantastic review, really shows a lot of the set better that isn't demonstrated well in other pictures. Zebe looks hilarious and the combination of SNOT construction, functionality/play features and sleek clean aesthetics is very impressive. And your bobba fett party-1-bus-whatevra-style is absolutely amazing. It's a brilliant set. I even got a second one just for the parts (I do have plans even for the large canopy piece). 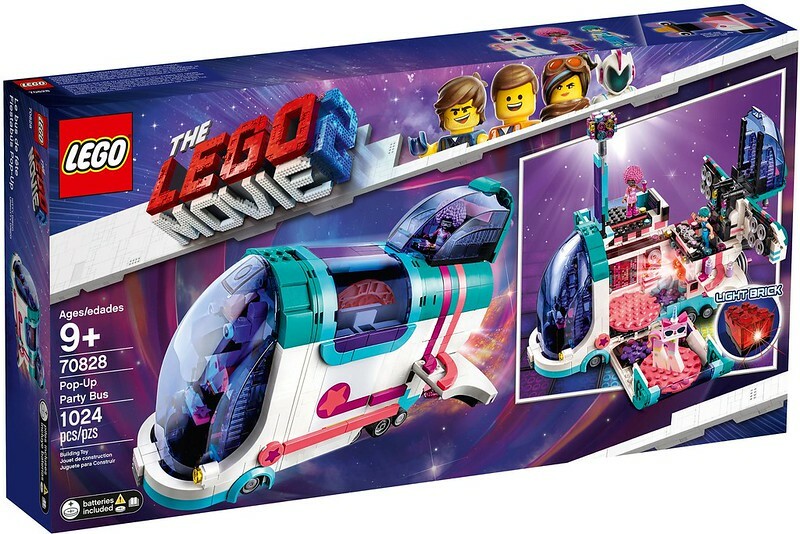 I think it says a lot about some folks' biases that a lot of people who feel underwhelmed by the LEGO Movie 2 sets seem to completely disregard it, and yet feel like Benny's Space Squad was a standout set of its wave just because it pandered to an extremely superficial sense of nostalgia. Couldn't agree more. 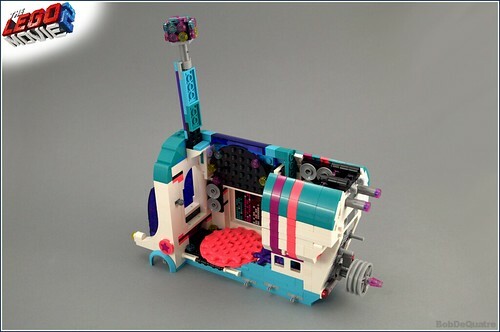 I would love if there were more of those over-the-top sets like the Party Bus and I'm really keen on getting the Spa and Space Castle, too. At the same time, though, I'm in fact underwhelemed by most of the other sets because of exactly what you describe - they are trying to hard to tug on the heartstrings of 40+ aged men and their childhood memories. Can't make up my mind about the Rex sets, too. They appeal to my technical interests and look nice, but at the same time somehow look oddly like those boy-oriented kids toys that I never had much use for. This set is amazing. One of the most ridiculously awesome sets I've ever built. Like, it should seriously win awards. I forgot to mention something... Every time I'm building a set and I can't find a part, I say to my girlfriend "Oh there's a part missing!". Now she knows that the part is there somewhere, hidden behind another part, or sometimes just in front of me but I can"t see it... That set was different, as I couldn"t find a part because it was the wrong part in the sealed bag! On the left is the Technic part that should have been in the set, and on the left is the one I got. Do you had the same problem with the set? A bit of a stretch to put brick built characters under the category "minifigures", isn't it? Seems a bit misleading to me. Some interesting colours in this set, but... that's about it for me. Too much going on in this set and the overall impression doesn't seem all that coheric to me. 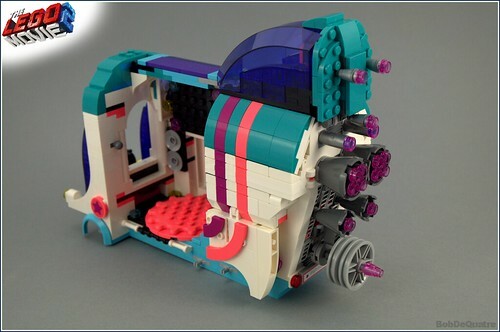 I guess I'm just one of those "boring and nostalgic" people who prefer stuff like Benny's Spaceship. Maybe it would make more sense to label that section of the review as "characters", but regardless, I think it makes a lot more sense to keep the appraisal of the characters in one place than to establish some kind of arbitrary hierarchy between characters who are brick-built and those who are not. After all, even BrickLink has been listing the brick-built "droids" from Classic Space sets as minifigures for well over a decade — long before characters like Unikitty or Zebe began showing up. Bricklink making mistakes as well does not change the fact that neither item is a true minifigure. Agreed. Brick built anything is not a minifigure. I agree that it's probably not accurate to call them minifigures. But as I said before, the ideal solution would be to group all figures together in a category called "figures" or "characters", not to arbitrarily segregate them based on what types of parts they use. After all, regardless of their construction, they perform a similar role in the set in terms of play value, storytelling value, and collectibility. I mean, how ridiculous would it be in a Star Wars review to talk about C-3PO's design in the same section as the "human" characters, but talk about R2-D2's design in the same section as the vehicles and props, solely because C-3PO uses minifigure parts and R2-D2 does not? Or to separate comments about Scooby-Doo's design and all the other characters' design into separate parts of a Scooby-Doo review because the literal main character is an animal? Furthermore, a LEGO monkey is about 89% classic minifigure parts. A LEGO skeleton is only around 17% minifigure parts. A LEGO baby includes no minifigure parts. Does that mean a monkey has more qualifications to be discussed in a review together with the minifigure characters than a skeleton or baby do? And for that matter, how do you deal with a character like Tee Vee from LEGO Alpha Team, who has classic minifigure legs but a four-piece, brick-built head/body? Where does that leave the Venom figure from 30448, who has a brick-built body but FIVE minifigure heads? How a "true minifigure" should be defined is not only messy and complicated, but as far as their play value, collectibility, or design quality is concerned, entirely meaningless. Some non minifigure characters have more, fewer or the same piece counts as classic minifigures. Some have more, less, or the same amount of articulation. Some cost more, less, or (theoretically) the same amount to manufacture. Some are larger, smaller, or the same size. The only potentially useful outcome I can think of for defining a clear definition and and differentiating characters on how well they adhere to it is to determine which character designs are or are not protected under the LEGO minifigure and mini-doll trademarks. But I don't see how organizing reviews on such terms would add any real value. In general, this is part of why I prefer to categorize LEGO play figures in my head as "characters" or "figures" instead of splitting hairs about just how far the definition of a minifigure should or shouldn't be stretched. Clearly, that way lies madness. Yes, we're all familiar with the concept of things not always being binary, but there's a pretty clear spectrum with a minifigure on one side and a completely brick built character on the other. I agree that it's probably not accurate to call them minifigures. But as I said before, the ideal solution would be to group all figures together in a category called "figures" or "characters", not to arbitrarily segregate them based on what types of parts they use. Ideal for who or what? Separating them by what parts they use is not arbitrary at all. 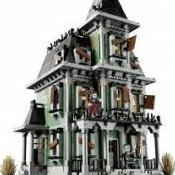 After all, regardless of their construction, they perform a similar role in the set in terms of play value, storytelling value, and collectibility. Disagree completely. And so does the Lego buying public. Minifigures are way more popular than brick built. I have to agree with Anchir on this one. I mean, are brick built figs like Groot, Ares, Giant Man, Queen Watevra, Metalbeard, Unikitty, ect, ect, ect, really any less relevant and collectible in their respective themes than the average minifig? It seems bizarre to insist on drawing arbitrary lines based on which specific Lego pieces are required to build which characters. If you're collecting TLM2 figures, the miniolls and brick built figs are just as key as everyone else. /shrug. This set has no 'minifgures' in it, in my opinion. It has four nice characters, fine. But if, for example, you told my son he was getting a set with four mystery 'minifigures' in it, he would assume that at least he could use the parts (heads, torsos etc) to mix and match with his Gotham or Hogwarts figures, to make new home-made minifigures. You couldnt do that that with these four characters. Sometimes words matter! LEGO themselves use "minifigure" for the classic figures, "minidoll" for the Friends-type figure and... other wording for brick built characters. 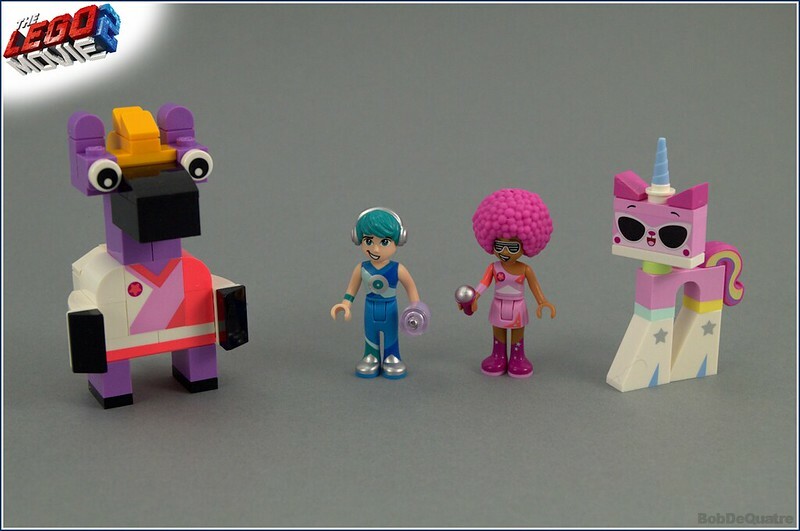 Please notice that the Uni-Kitty collectible series does not, as the only series in the entire lineup if I'm not mistaken, contain the word "minifigure". 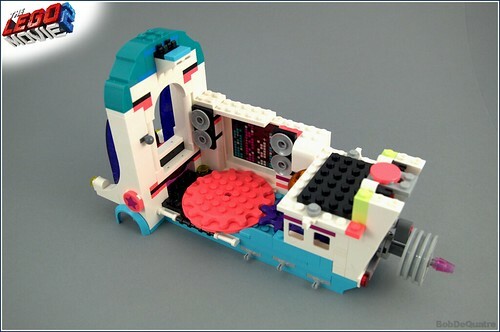 We can discuss personal preferences all day long, but.. perhaps we should listen to the offical LEGO descriptions? 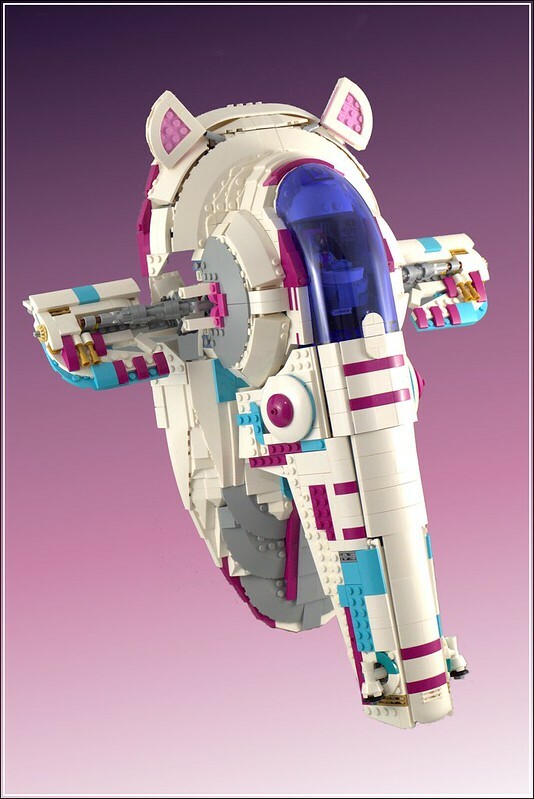 Say, maybe you should build a smaller, non-UCS counterpart to this utilizing the other Trans-Purple Slave I canopy that comes with the Pop-Up Bus, perhaps basing it off of the instructions for this year's 75243 Slave I: 20th Anniversary Edition! So it wouldn’t seem at all strange in a review of a Star Wars set to categorize R2-D2 together with the vehicles and scenery when assigning number ratings, instead of with C-3PO? Popularity isn’t the point. Themes that feature both minifigure and brick-built characters do so when the brick-built characters are intended to stand out from minifigure characters for an actual reason, whether it’s having body shapes or proportions that are not meant to look human-like (like R2-D2), being “cyborgs” with a mix of human and machine/vehicle parts (like Metalbeard), being too big in the source material for a minifig or even a bigfig to adequately represent them (like Giant-Man or the Sentinel), or in some way representing freeform creative building and the freedom to change shape and size that comes with it (Unikitty, Watevra, Clayface, etc). But as long as they are treated as characters/“people” in the source material rather than objects, vehicles, or non-sapient animals, then kids can be expected to play with them and think of them as characters/people, and it seems crazy to insist on treating them as if they’re an inanimate object. I agree words matter. That’s why I am advocating for more use of terms like “figures” and “characters”, particularly when dealing with sets or themes like this in which minifigures aren’t treated as the constant default. 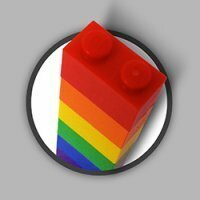 Is anybody here this pedantic about Fabuland reviews that put the characters under a Minifigs header? Or Star Wars and The Hobbit reviews that include specially molded or “bigfig” characters like Jabba, Sebulba, Gollum, or the Goblin King under the same header or as part of the same ratings criteria? Or is there something about this set/theme in particular that makes people feel like the definition of a minifigure is under attack and needs you to leap to its defense? 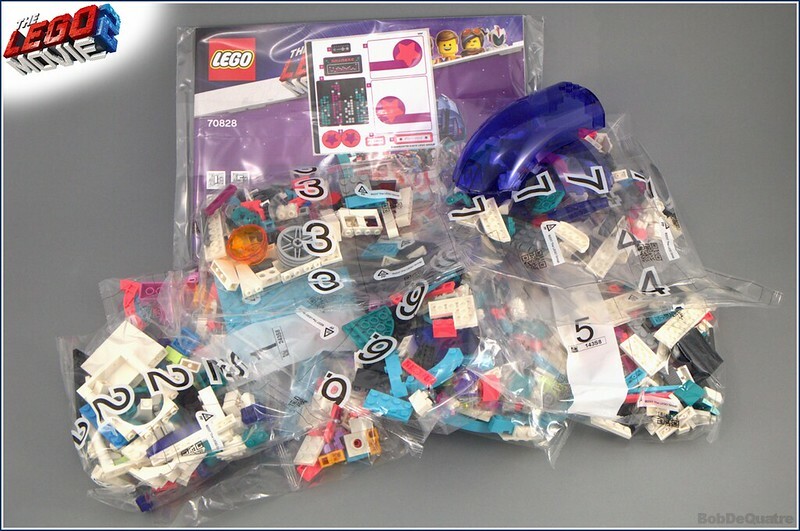 I agree with the difference between the official wording of minifig/minidoll and character (unikitty), they even put "1 LEGO Character" on the The LEGO Movie 2 CMF bags, 1 is Unikitty. 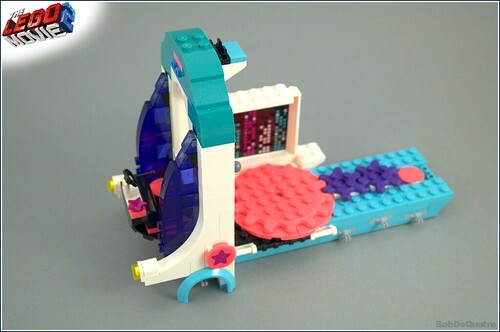 While on previous ones the text has been "1 LEGO Minifgure" . However it's getting harder to stay true to the term Minifgure with so much variation nowadays, from many head molds, leg lengths (short/medium/normal), to multiple "robe/skirt" bricks, to Ghost legs and Rogul legs, to 4 armed figures seen in Ninjago etc. And then there is the appearance of not-so minfig characters that can still hold items in their hands, and some can move their legs/head as well, like Scurriers, Squirebots, Bricksters, Battle-Droids, Skeletons, Martians (Life on Mars 2001). Then there's some more distant categories like mostly single-parts (Globlins), larger figures with articulation (Burnzie/Sparkks), Brickbuild without articulation (cloud Monstrox, or movie maker queen whatevra), or Holograms (Merlok/Monstrox). And then Animals have many different variants as well going from 1 to multiple pieces, to creator brick build. R2-D2 isn't a minifigure. Like minifig scale dogs and horses, or those crappy Mars Mission aliens, he's something, and not brick built, but not a minifigure. I'm not sure what to call him. You mentioned "play value, storytelling value, and collectibility". Popularity gives a good idea of how the public rates those. Popularity pretty much single handedly determines collectibility. My party bus specifically was fine though.